I know you're all wanting to know about the cool big stuff at NAMM (and it'll come), but for this headphone junkie, when word hit me of an upgrade to the current DJ favourite HD25 cans, I was obliged to investigate. 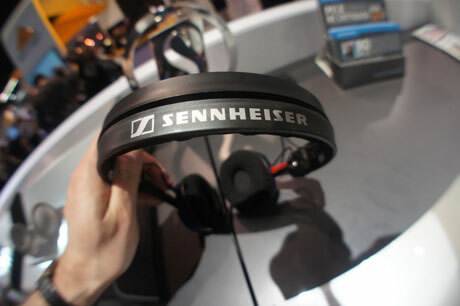 Behold the Sennheiser Amperior - the oddly named superior DJ headphones. First seen at CES, these are the HD25s with knobs on. Picking them up yields a heavier more solid feel. They come with metal cups and trim to cover the hinge screw, as well as thicker round cable instead of flat 2 core cables and a detachable iPhone control. The covers and headband are upgraded to a velour material too. I like the extra weight. The HD25s can feel flimsy because of the super lightweight construction, but the added cups and heavier cable add to the perceived quality. But all these extras cost. The Amperior cans come in at an eye watering $350. That's a serious amount of anyone's cash, but people are prepared to drop large cash for such things. They come in Blue and Silver. I'd have liked Black over both of those. Do you like the Blue ones? The trusted sound and reliability professionals rely upon day in and out... remixed. Introducing the Amperior series from Sennheiser. From the moment you lift the lid of the meticulously packaged gift box you are welcomed to an exclusive, elite family of Sennheiser owners. The precision workmanship, impeccable detail and emphasis on quality, reliable materials leave no doubt in your mind that this is what sound should embody....and you have not even pressed play yet. Razor-accurate percussion instigates head-bobbing. Soaring mids and trebles get you closer to the original studio mix. Full-bodied bass lines are effortlessly lifted out of the mud and placed deep within your conscious. This is what it was like to be there when the song was finished. This is what it is like to be Sennheiser. Some headphones make their biggest statement around one's neck. The Amperior series makes its namesake on your ears. As someone who has had one pair of Sennheiser HD25s last 13 years, I would love to see these simply in black, they are not Adidas co-branded nor Pioneer, so black would be awesome and my colour of choice.. I do like the shinny bits! Did they sound good Giz? Flat like the 25s or migraine induced thumpers with colour'd bass? The sound quality would have to be some next levelness bizness for that price. i'd be hard stretched to throw that sort of money at new cans no matter how great the are. I'm sure there are enough people who will snap them up. That's a huge jump in price though, considering they have kept the same construction and pretty much the same materials. One prob with these I see over HD 25 IIs for DJ use: The ear cup pads are velour like fabric, not smooth leather like, which IMO will be sweat magnets. In response to Jacks post above. The fabric cup pads that come as spares for existing HD's get ruined really quickly, especially if your a bit beardy and unshaven. Seriously, they get rough and ruined. Another minus point. Unless they come with proper leather (or whatever it is) cups these will not be as hard wearing as the best headphones available, the current HD25ii. Improved sound quality? How? I'd need some major improvement to upgrade my current HD's and it's hard to imagine such an improvement. I'm open to being proved wrong though. The cable looks a lot more sturdy. How many times do you see curled up, messy HD cables, all the damn time but with a little mod using 'TechFlex' your current HD's need never get twisted up. I bet they sound fantastic but I have no complaints with my current HDs. I wonder if the replacements parts for these will be compatible with the HD-25's? It'd be great to add the new cable to my existing cans. I've never owned a pair of Sennheiser's for one reason and one reason alone... no coiled cable. Seems like the HD25s with a paint job and new material but damn near identical in functionality. @Dizzy: Did you not know the cable can be swapped to whatever style you want?